In recent news, the four major Telcos - MTN, Glo, Airtel and Etisalat lost a huge number of subscribers; and now, they're doing everything possible to win their lost customers to them. On the quest of doing so, Airtel launched some set of new offers, which are Airtel double data plan and Airtel 150% data bonus. While Etisalat started with their Ramadan data offer of 1GB for N200. Still on the matter, Etisalat is calling on their lost subscribers who has dumped their Etisalat sim card for more than 1 month. If you have dumped your Etisalat sim card for over a month due to one reason or the other, Etisalat is calling you back with a surprise package waiting for you. WHAT'S THE SURPRISE ALL ABOUT? First of all, go and dust your Etisalat sim that you have abandoned for a long time. 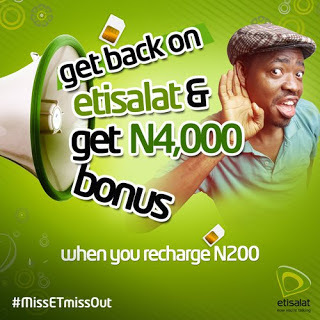 Etisalat is offering you N4,000 when you recharge your Etisalat line with N200. Isn't this welcoming? Like I've made you to understand, this is just a way to get back all their lost subscribers, and this should sound to you that this offer is for old customers who dumped their sim on a dusty cupboard for a period of 30-180 days. If you have an Etisalat sim that you have dumped for over a month, kindly look for that sim and dust the hell out of it. Then, recharge N200 and you’ll receive N4000 (3000 for data + N1000 for calls to all networks) extra bonus which you can use to call, and browse your favorite sites like Entclass.com.ng. When you recharge N100 the second month, you will get a N2,000 bundle (N500 airtime + N1.5k data). Isn't this interesting? WHAT'S THE VALIDITY PERIOD FOR THIS OFFER? The validity period for this offer is 30 Days. Note: This offer is for those who intentionally dumped their Etisalat sim for over 30-180 days. If you have been using your sim as a committed etisalat subscriber, then you should try the Ramadan offer. This offer is tagged as #MissETmissOut by Etisalat. I think this should be enough for you to stream and browse your favorite sites. What do you think? Go for their Ramadan offer if you are eligible. Click here for Etisalat Ramadan offer 1GB for N200. Ummmmmmmmmmmm. Let me check for one of those Sims I use to do Etisalat data bundle. Just wondering what network were those that dumped all mentioned network in the context using? "In recent news, the four major Telcos - MTN, Glo, Airtel and Etisalat lost a huge number of subscribers"
Funny comment. This is business. They sure lost their customers to another. You shouldn't try it if you haven't used your sim for 30days. If I recharge with my bank, will I get the bonus or must I recharge it manually? Yes you will get the bonus. The offer is good but with the coming of 9mobile, i think it would have been changed.